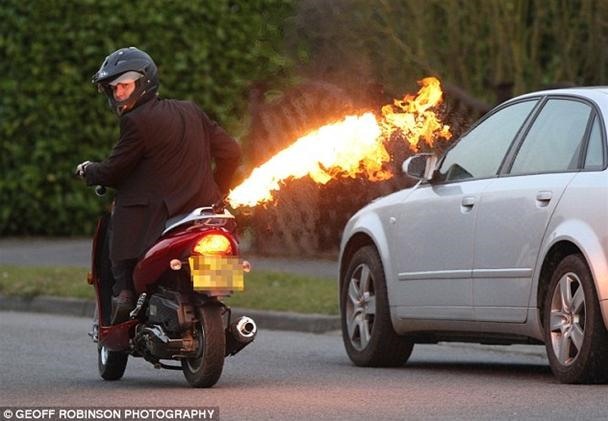 "Colin initially tried fixing his road-rage weapon to a BMX bike and it worked so well he decided to try it on his moped. Now he has even attached a lever to change the angle of the flames. But sadly Colin, who built the moped in his spare time in his back garden, will not legally be allowed to use it on the road. 'I've been told that if I fire the flames while riding on the road it's equivalent to using a firearm and I could be in a lot of trouble,' he said. 'Unfortunately I won't be able to ride it into the centre of town but it's a lot of fun and I'll use it off-road.'" 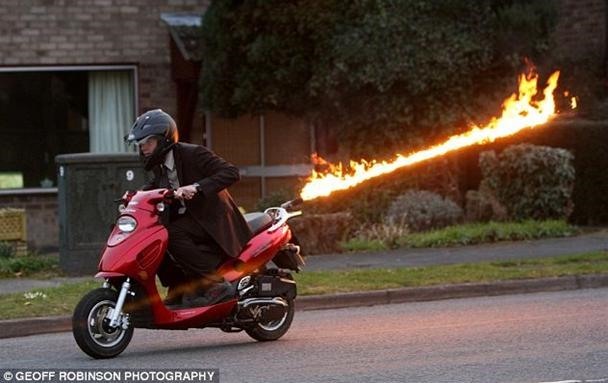 Previously, Crazy Rocket Launcher Motorcycle Mod. Something way too cool on something way too lame. Unfortunately I won't be able to ride it dizi izle into the centre of town but it's a lot of fun and I'll use it off-road.'"